Mark Your Calendar - National Prescription Drug Take-Back Day is April 26th! Have prescription drugs that you no long use or that have expired? Dispose of them properly through an initiative with the Drug Enforcement Administration on April 26th. The number of accidental poisoning and overdose cases due to prescription drugs are alarmingly high in the U.S. To help combat the matter, the U.S. Drug Enforcement Administration (DEA) and local agencies around the country have designated April 26 as National Prescription Drug Take-Back Day. 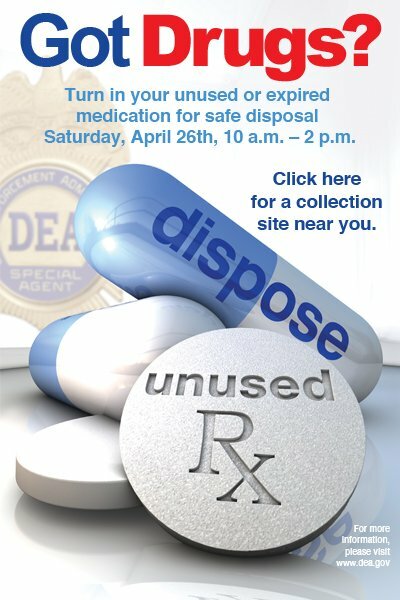 From 10 a.m. to 2 p.m. on April 26, collection sites from around the country (including health organizations, police, drugstores, local governments, environmental groups, and others) will give the public the opportunity to properly dispose of potentially dangerous expired, unused, and unwanted prescription drugs. Only pills and patches will be accepted. The service will be available for free to the public and may be done anonymously with no questions asked. This initiative addresses a vital public safety and public health issue – reducing access to highly-addictive drugs, the risk of poisoning, and environmental contamination. Studies have shown a majority of abused prescription drugs are obtained from family and friends, including from the home medicine cabinet. Also, disposing of medicines by flushing them down the toilet or throwing them away in the trash is cause for environmental harm by contaminating our waters and the chance of drugs getting into the wrong hands. This event is the eighth one in three years. Last October, 324 tons (over 647,000 pounds) of prescription drugs were turned in. Since the start of the initiative, more than 1,700 tons (over 3.4 million pounds) of pills have been taken in. New regulations are in the process of being approved by the DEA for a more safe and standardized method of disposing controlled substances. For a full list of collection sites, visit the DEA’s National Take Back Initiative Collection Site Search page or call (800) 882-9539. Photo via U.S. Drug Enforcement Administration. Subject: LongIsland.com - Your Name sent you Article details of "Mark Your Calendar - National Prescription Drug Take-Back Day is April 26th!"